Good afternoon, friends! It's been FAR too long since I posted an authentic Nutrishus recipe, so without further ado, I present you with the perfect summer treat! As I searched our cupboard for cookbooks to choose inspiration from, I came across one of my most favorite, the most classic: "Lady and Son's Cookbook" by Paula Deen, which arguably started it all. You can say what you want about the woman, but I happen to think she, like all of us, sometimes says things she doesn't mean. Aside from my PR statement in an attempt to cut her some slack, one thing no one can deny she's one wholesome, talented cook!! This delicious, and super simple recipe is based on her Pear-licious Cobbler. Only I have made it gluten free, used nectarines, butter made from the milk of grass-fed cows [so you get more Omega 3's which all of us could use more of! ], less fat[kefir], and a little less sugar. I also added my secret ingredient which I have been meaning to use since I got back from France over a year ago-- Sirop de Lavande. This is ridiculously simple, and if you don't have any of the ingredients I switched in, feel free to get creative. You could use peaches, pears, raspberries, blueberries.... etc.. instead of the nectarines. And obviously if you don't have the Sirop de Lavande--simply sprinkle a bit of brown sugar on top! Food lovers everywhere: For best results, serve this right out of the oven with a scoop of french vanilla bean ice cream on top. MELT IN YOUR MOUTH GOOD. 1 tsp vanilla extract--- and if you're lucky, vanilla beans! First place the butter in a baking dish and place in oven at 350 degrees F until the butter melts. Peel nectarines and cut into slices, set aside. Remove the baking dish from the oven (but keep oven on). Stir together the brown sugar and brown rice flour. Slowly stir in the kefir and mix well. Pour the batter over the melted butter in the pan. Do not stir. 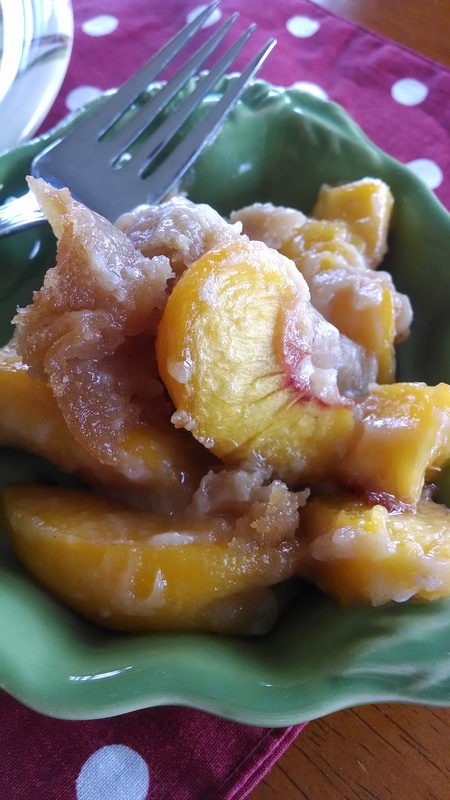 Place the nectarine slices on top of the batter; gently pour the Sirop de Lavande over the nectarines. (Or, if using instead, sprinkle the brown sugar on top of the nectarines). Do not stir. Bake the cobbler for 30 minutes. Remove from oven. This is how it comes out! It's honestly so delicious that you don't even need ice cream! Gooey, somewhat crispy, not-too-sweet, delicious!